I’m Only Dreaming further solidifies Eisley as one of the best modern indie rock/pop groups. Ever since the release of their 2005 debut, Room Noises, Texas quintet Eisley has stood out like a radiant jewel on the beach that is modern indie rock/pop. Influenced by an incredibly wide array of artists -- including Radiohead, Death Cab for Cutie, Björk, Pink Floyd, Fleetwood Mac, the Flaming Lips, Sigur Rós, Joni Mitchell, and Sufjan Stevens -- their music manages a marriage of poignant songwriting, charming vocals, and animated yet articulate instrumentation that only a few of their contemporaries have ever equaled. Fortunately, their fifth studio LP, I’m Only Dreaming, raises the bar even further, utilizing both the upfront dynamics and behind-the-scenes emotion of a new formation to yield the most focused, steady, and instantly appealing record of their career. In 2015, both founding guitarist Chauntelle D'Agostino and longtime keyboardist/singer Stacy King left to pursue other projects, leaving founding vocalist/guitarist Sherri DuPree-Bemis as the sole original member. Luckily, she and bassist Garron Dupree (who’s also her cousin) quickly rounded out a new line-up with drummer Remington Dupree, guitarist Elle Puckett, and keyboardist Jedidiah Lachmann. While such changes often substantially alter a band’s approach (for better or worse), they really don’t here. Instead, Eisley’s signature sound is still quite intact, only with slightly less nuance and a stronger emphasis on endearing melodies and soothing melancholia. As a result, I’m Only Dreaming is their most gorgeous, heartbreaking, mature, and accessible release to date. The album kicks off with the most alluring track in the group’s entire catalog, “Always Wrong”. A steadfast rhythm guides gentle guitar riffs as DuPree-Bemis unleashes poetic outcries like “Whisper my name / I will find you / I will fly in my mind / I feel you inside / As I slide over the sky." Both these verses and the choruses -- “And I know I'd only let you down / And I know you won't stick around / But I'll make sure / I'll keep you coming back” -- are utterly infectious not only because of how inherently catchy they are, but because of she how delivers them with unrivaled angelic conviction. Add to that an even denser and more delicate bridge, and you have an infectious and moving gem that hints at how impressive I’m Only Dreaming will be. “Defeatist” is thicker and more direct, with lovely accompaniment as DuPree-Bemis professes starry-eyed dedication and empowerment, whereas “A Song for the Birds” is a breezy and upbeat duet with Say Anything mastermind Max Bemis, who counters her fanciful air with a more grounded persona. Next, “Sparking” incorporates a bit of electronica via a programmed drumbeat and waves of synth, both of which make the relatively thin arrangement and wounded sentiments even more intriguing. As its name suggests, “My Best Friend” is among the most richly romantic pieces here, with every element contributing to an enveloping sense of idealism and regret. The real magic of the track, though, is how lines like “And I'm carving your name in the tree / Where I sit and pray about all of the things I've done” and “And when I hold you / I will uphold you / You are my best friend” avoid feeling saccharine and cheesy because of how eloquently and earnestly they’re sung, as well as how luscious yet controlled the music is. “Rabbit Hole” acts as a bittersweet acoustic ballad whose somber sparsity makes it hypnotic. Afterward, Circa Survive frontman Anthony Green is surprisingly restrained on “Louder Than a Lion”, adding some edge to both his lone segments and DuPree-Bemis’ rising chants without unleashing his token frenzy. Like “My Best Friend”, “You Are Mine” is quite affectionate, albeit in a grungier and less whimsical way, like a classic Garbage tune. Even its lyrics depict a surprisingly relatable reaction to a lover: “You're my everything / My sun and moon / You make me swoon / Wake me up, talk too much, piss me off / But you are mine”. It has as much independence and boldness as it does smitten loyalty, which is another reason why Eisley stands out from the pack. The final three songs end the collection very well, although “When You Fall” feels a bit too safe and effervescent. It’s a fine song in its own right, but it doesn’t pack the same punch as the others. “Snowfall”, on the other hand, is downright haunting. Led by a harp-esque arpeggio and shuffling percussion, it builds brilliantly from a serene ode to an impassioned and textured rocker. In a way, it’s like two different songs fused together, making it the most unpredictable selection in the sequence, whereas “Brightest Fire” serves as a very fitting -- if also familiar -- closer. There’s a palpable sense of finality, hope, and closure in its words, melodies, and chord progressions, so it’s perfectly placed at the end. 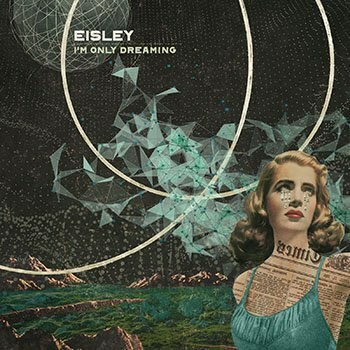 I’m Only Dreaming further solidifies Eisley as one of the best modern indie rock/pop groups. Of course, the most obvious reason why is DuPree-Bemis, who seems to genuinely seems to feel every word she sings, but her voice wouldn’t be as impactful if it weren’t surrounded by such wise and vibrant instrumentation. While this record isn’t quite as nuanced as Currents or as heavy as The Valley, it’s easily the band’s most attractive, developed, and heartfelt full-length yet. Honestly, it stands as a benchmark not only in Eisley’s discography, but for the movement as a whole, and any fan of the genre should check it out.